Hi everyone- how are you adjusting to daylight savings time? I'm loving the early morning sun, but the evening blackness will take some time to get used to. I was telling Megan this evening that it isn't all bad. The early night makes me want to settle onto the couch at about 6:30 and do nothing for the rest of the evening. I'm not going to be able to keep that pattern up for long without consequences, so perhaps a re-commitment to the Worthington recreation center will be in my future on these upcoming dark winter nights. Speaking of dark nights- when Megan and I visit Maine come Christmas time, the north woods sky will be pitch black by 4:30 or so. It's amazingly early. I can't imagine living a full winter with that little light, but this bird is probably used to it. Megan spotted this avian friend on the top of Streaked Mountain on October 2009 near South Paris, Maine. This was a new one for me, and observing it and photographing was thrilling. Do you recognize it? P.S. The pronunciation of the Mountain in question is not the same as if I were to say "I just streaked through the streets of Worthington." It is decidedly said with two syllables, as most words in the local vernacular of western Maine are drawn out into two, three or four syllables where here in Ohio they would just be one syllable. Say Stree-ked mountain, and you've got it down. Cheryl calls it a Gray Jay, and I would have said Canada Jay. Are they the same bird? I've never seen one in Saratoga County, NY. Cheryl, yep, this was my first Gray Jay sighting. When I was looking at it in the field, I really had no clue what it was. 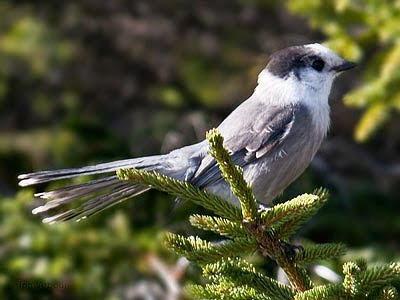 But a after a little poking around on the internet, and ruling out some type of shrike because of the absence of the hooked bill, i came up with Gray Jay. Jackie- I think that Canada Jay is an older "official" common name that is sometimes used for this species. It dips down into the us in Maine (and maybe even some in the adirondaks- check out the little blip on the range map on Wikipedia), northern Minnesota, Wisconsin, and Michigan, and also the Rocky Mountains. Good bird, and a great photo of it! Would be a lifer for me too, even though their normal range ends just a couple hours north of here.